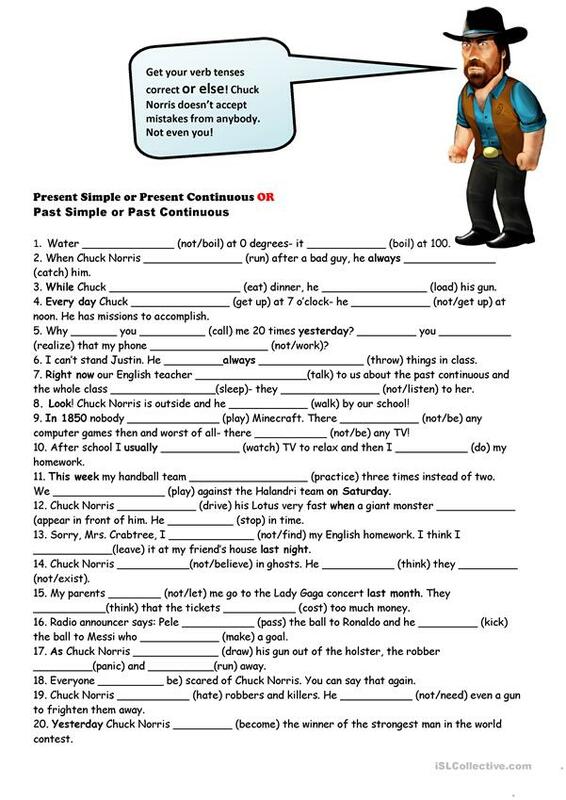 2 Page review of the Present Simple + Continuous/Past Simple & Continuous tense with a Chuck Norris theme. Page 1 students complete the correct form of the verb and on page 2 fill in the missing helping verb. Chuck Norris is always good for a laugh. The above downloadable handout is meant for high school students at Pre-intermediate (A2) and Intermediate (B1) level. It is aimed at practising Past continuous (progressive) tense, Past simple tense, Past simple vs continuous tense, Present continuous (progressive) tense, Present simple tense and Present simple vs continuous (progressive) tense in English, and is excellent for strengthening your pupils' Reading skills. It is about the vocabulary topic of Actions, Celebrities (stars, famous people), Humor, People and Personality and character.